The Feelfree Moken 12 Angler is a feature packed sit on top kayak which is just as suitable for touring as fishing thanks to great speed and directional stability. The Moken 12 Fishing Kayak. Introducing Feelfree's ultimate fishing kayak – the Moken 12. Named to honor the Moken people, whose nomadic sea fishing culture helped them survive the 2004 tsunami, the 12ft Moken brims with features fisherman crave. It sports a bow storage plus two additional cockpit hatches, with additional room for a storage crate and bait bucket. The Moken 12 offers you a kayak with good paddling performance in both speed and stability. 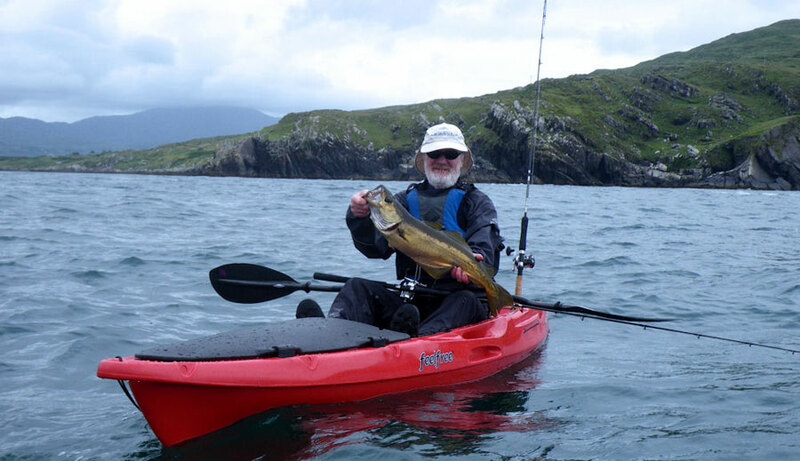 It’s the ideal kayak for fishing and if you leave the rods at home it’s a nice touring sit on top as well. The Angler spec has the hard bow cover which is a wet space to keep your catch fresh and does not open into the hull – a great safety feature. Other features include rod holders, paddle park, wheel in the keel and the Moken 12 can be fitted with a Feelfree seat of your choice. Within reach of the paddler is a handy flip-up console for lures and gear, with a nearby mounting area for additional fishing rod holders and fish finder. Completing the outfitting are molded-in carry handles on the bow and sides making this easy to load and transport. Bow storage with Hard hatch. rod holders, GPS or fish finder. Handy flip up console for lures. These images are for colour representation only. We offer a delivery service for the Feelfree Moken 12 throughout the UK & Ireland to home and work addresses. If you are local to our shop in Hamworthy, Poole then we may be able to deliver a Feelfree Moken 12 with one of our own vehicles. For boats, this is free to most BH Postcodes - please call us on 01202 625256 to discuss your requirements. Buy a Feelfree Moken 12 online from our website and collect from our shop in Hamworthy, Poole or you can collect from any branch within the Canoe Shops Group. There is no cost associated with instore collection.